Beginning from Microsoft Office 2007, Word, Excel and PowerPoint uses new Office Fluent Ribbon user interface with a big right pane section of the Office or “File” menu been devoted to “Recent Documents”, “Recent Workbooks” or “Recent Presentations” list. The recent files list records each and every files that user opens recently, and display the list whenever Office button or “File” menu is pressed for quick easy access. Since Office 2013 and Office 2016, Office apps also display “Recent” list which shows all recently opened files upon launching of Office apps such as Word, Excel and PowerPoint. The “Recent Documents”, “Recent Workbooks” or “Recent Presentations” list in Word, Excel or PowerPoint shouldn’t be any problem if you’re the only user on the computer. However, if the same computer and same user account is shared by many people, or you’re using a borrowed or public computer, the recent files list will expose documents using trace. To protect your privacy, users need to delete all file opened history in “Recent Documents”, “Recent Workbooks” or “Recent Presentations”. Click or tap on Office button or File menu, and then click on Word Options (in Microsoft Word) or Excel Options (in Microsoft Excel) or PowerPoint Options (in Microsoft PowerPoint) in the bottom of Office Menu. In Office 2013 or Office 2016 or Office 365, go to Options. Set the value for Show this number of Recent Documents: (for Microsoft Word) to 0 (zero). Repeat steps above again, and set back the value for the number of Recent Documents to show to its original default, i.e. 17. If you don’t want this particular Office application to remember any Recent Documents, you can leave the value at 0 and skip this step. You have to perform the above steps for Word, Excel and PowerPoint individually, where the option name is Show this number of Recent Workbooks: in Excel and Show this number of Recent Presentations: in PowerPoint. 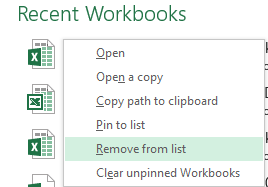 And if you not intend to delete all entries in “Recent Documents”, “Recent Workbooks” or “Recent Presentations” list, it’s also possible to right click on a recent file and select Remove from list to delete the entry from the recent files list. In Office 2007 and Office 2010, uses the following registry trick instead. The trick can also be used if you don’t want to perform the task to clear the recent files list one by one on many Office products, it’s possible to clear and delete the “Recent Documents”, “Recent Workbooks”, “Recent Presentations”, items, all or some of them, in the registry. Each registry key represent a corresponding Office product respectively, which should be pretty obviously. Inside the File MRU key, there are plenty of items on the right value pane. Delete any – one, some or all – of the item entries that you want to make disappear and delete from “Recent Documents” list. Restart respective Office 2007 program to see the changes.